Looking at Hamsters, the first thing that comes to their mind is how cute they are. But your cute pets have another side their personality. And one more interesting fact about them is that Hamsters are Omnivores animals. No one can even imagine that the cute little things can be fond of other living beings too. The Hamsters living inside the house as pets usually get their essential nutrients from fruits, vegetables and other food items that have rich compounds. But in the outskirts, Hamster is more likely to eat other non-plant things like meat, worms, beef and other things too. Yes, Hamsters are really omnivorous, and hence they can eat both plant-based and non-plant based food items which vary from snacks to meat. But surely that doesn’t mean that they will eat everything that you offer them. Hamsters are a little bit fussy about the food they consume. So, the next time you give them something to eat, ensure that the food has every essential vitamin and protein in it to keep them healthy. Why Must Hamsters eat Non-Plant Food? What Items should Hamsters Eat? What is the Plant-based Food that must be given to Hamsters? Protein is very significant for Hamsters. This is the nutrient their body so desperately needs and hence eating a protein-rich diet will provide them enough energy for the day. Hamsters only eat the food that their body requires, and they need 17-29% of their diet to be pure protein. And as we all know, the protein-rich supplements are non-plant foods like meat. In the wild hamster do always manage to find some grass to eat to fulfill their needs but they usually rely on insects and worms for their protein. But in homes, it is hard for them to find worms and insects, so the pet owner must include some nonvegetarian food items in their diet plan. Deciding what Hamsters really like is totally dependable on every individual hamster. It is just like humans. Every human has a different taste of food, and the same can be said for Hamsters too. As they can eat both plants and meat, mixing both the foods together can be a great idea. But you can also give them separately as you like. Some of the items that would be fine for the hamsters and will also meet their physical requirements are given below. Finding living mealworms and cricket can quite tricky, but that doesn’t make it impossible to find them. You can either go in the wild and gather them up one by one or go for the dead mealworms and cricket. You can found them in a store that provides pets foods and gives them to your hamsters. They are the most obvious choices for them because of the high-fat content in these organisms. Many fitness freaks already know that Chicken is one of the best sources of protein. And along with protein it also contains vitamin and phosphorus that are healthy for the body. But just because it contains all the nutrients doesn’t mean that you should give an unlimited supply of chicken to your hamsters. A quarter spoonful in every 1 or 2 weeks is enough for them to sustain the protein in their body. If you give other food too, then the amount of chicken can be adjusted according to those items also. This is another dietary supplement which is highly beneficial for the hamsters. But before giving beef to your small pet, you must ensure that it is adequately cooked otherwise it will do more harm rather than benefiting the hamster. A quarter teaspoon just the same amount of chicken is quite enough for them. You will be glad to know that other than protein, Beef also has Vitamin B12, Zinc, and Iron which is also a part of the hamster important nutrients list. Reading about eggs, you might be thinking that eggs are apparently good for everyone. Most of the pets love to eat eggs every now and then, and the same can be said for hamsters too. Giving a half teaspoon of eggs in a week or two is appropriate. You can go for either boiled or scrambled egg to give to your hamster. As the eggs contain 7 grams of protein which is the high amount as compared to any other food material, the hamster would be happy to eat it. It must be remembered that raw egg should never be given to the hamster as the Salmonella pathogens might be present in it which are dangerous for hamsters. Other than that you can also opt for Pork, Shrimp, Fish, Turkey, and other similar items. But at first, ensure that they are entirely safe for your hamster. We have already discussed the nonvegetarian diet the hamsters can have. But it essential that you know a little about the plant-based food items too. Usually, Cheese, peanut butter and plain tofu are like a great reward for the hamsters. They enjoy a small amount of peanut butter and a low fat cottage cheese. Apart from these foods you can also give other snacks and treats to your hamsters but check that they don’t contain ingredients like avocados, seasonings, ham, tomato leaves, etc. which are harmful to them. Hamsters can eat Baby Food as it doesn’t contain any preservatives. If your hamsters have trouble digesting the heavy food materials, then you can choose baby food as the ideal solution to its diet. Finding out that their hamsters are also non-vegetarian can be interesting of the humans, especially when they are non-vegetarian themselves. But the news can be quite devastating to the Vegetarian. But no matter what they eat, Hamsters are undoubtedly the cutest pet that you can own, and you must take proper care of their diet to keep it balanced. 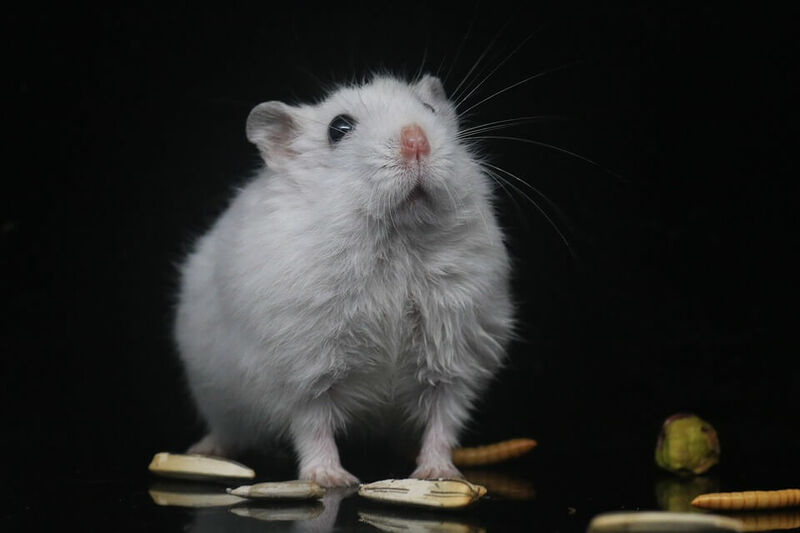 Some food items can be added into your hamster’s diet, so have a look at the list of items that are suitable for them and then give them what their body needs.